HomeBooks by AgeAges 0-3Thanksgiving Books: More Turkey, Please! TCBR analysis: A comical, backwards countdown from 10, for the youngest readers. Bright and entertaining illustrations. Publisher’s synopsis: “Looky!” says a silly turkey swinging from a vine. Gobble gobble wibble wobble.Whoops! Now there are nine.Girls and boys will gobble up this hilarious story about ten goofy turkeys and their silly antics: swinging from a vine, strutting on a boar, doing a noodle dance, and more. Veteran author Tony Johnston has written a joyful text, which first-time illustrator Richard Deas brings to life as wild and wacky fun! TCBR analysis: Witty rhyme offers readers a fun perspective on the personality and lifestyle of a turkey. Publisher’s synopsis: As he did in GOBBLE IT UP!, Jim Arnosky has created a charming picture book from a catchy, spoken-word song that is a favorite in schools everywhere. 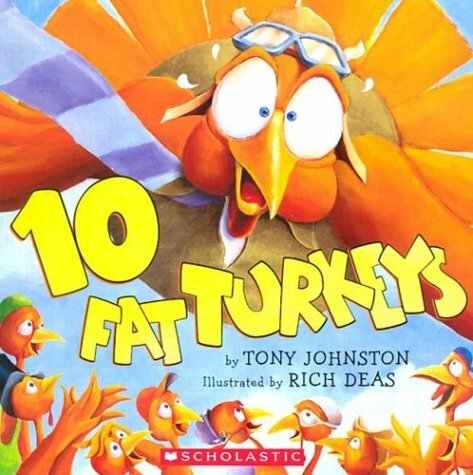 This humorous song, filled with factual information about turkeys is fun for Thanksgiving — and all year around! This will make a great combination with Jim Arnosky’s All About Turkeys. TCBR analysis: Simple text that is packed with giggles. Sure to bring smiles to beginning readers. Publisher’s synopsis: It’s Thanksgiving, and Noodles wants to join the fun. But Noodles doesn’t like his part in the holiday parade: he doesn’t want to be the Thanksgiving turkey! Noodles tries to be creative. He finds a clever solution to his problem and leads the parade–by turning his costume’s tail feathers into a proud chief’s headdress! This funny Level 1 story is perfect for beginning readers.